If a selective or direct call is urgent and the called station in busy. The control room has priority “BARGE-IN” facility. Groups can be programmed in the central control unit. When a station is connected to more than one group, access will be on “First – Come -First-Serve” basis. 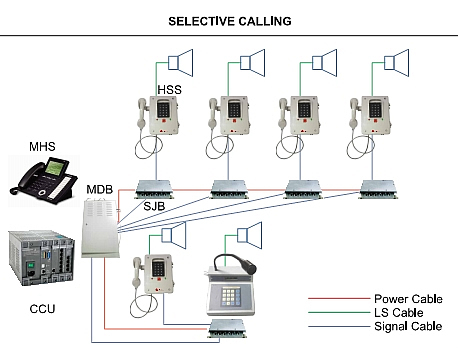 If any station is busy, the calling station can keep the call pending or can “Be- in- queue”. While the call is in “Q”, it is free to receive incoming calls. CLEAR voice reproduction with high syllabic articulation, even under adverse acoustic conditions. Dynamic compression of signals from microphone amplifiers prevents overdrive of amplifiers, resulting in clarity of announcements. The page channel will be active for a prescribed time. If the called party answers the call within this predetermined time, communication automatically shifts to the party line.Up to four stations can be in conference on party channel. The line gets “reset” automatically in case there is no response from the called party.